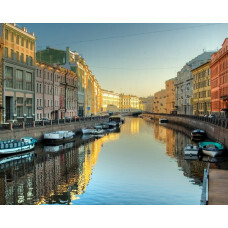 St. Petersburg is famous for its rivers and canals, which cut the city in many of its parts. St. Petersburg was built in the delta of the Neva river and is spread over numerous islands of different sizes, frequently prompting the nickname "City of 101 Islands" or the "Northern Venice". Over the centuries numerous bridges were built to connect these islands across the Neva and many canals like Moika, Fontanka, Kanal Griboyedov canal. Wide full-flowing Neva is conceived as the main prospectus of the city along which majestic palaces, temples, gardens, monuments are stretched. The combination of the architecture and water in St. Petersburg, as well as in Venice, has a special charm. Rivers and canals boat trip is considered to be one of the most enjoyable pastime during St. Petersburg visit.